The Haul-Master Motorcycle Wheel Chock (Harbor Freight item #96349) is an unbelievable bargain and perhaps the best thing for both you and your bike since preferred parking at the local fair-trade coffee shop. 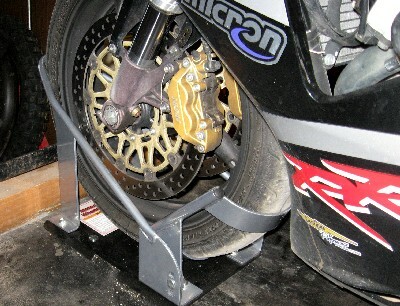 If you are looking for a secure, well-made system for securing a bike (with 17" wheels) that can be used in your shop, in your truck, or on your trailer look no further. 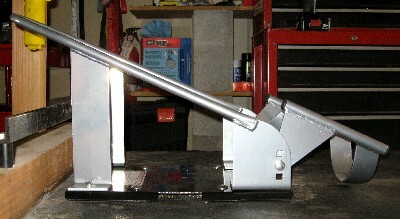 The Haul-Master wheel chock, in spite of costing less than 1/3 of most competing units, is remarkably sturdy and well made and very easy to operate. Installation is a snap and it comes with all of the necessary mounting hardware (carriage bolts, bushings, washers and nuts) for a truck bed or shop lift. You could also bolt the Haul-Master chock directly to a concrete shop floor though this would likely involve drilling a different set of front holes to accommodate the access needed to securely set concrete bolts. The Haul-Master unit is a tutorial in the merits of design simplicity. 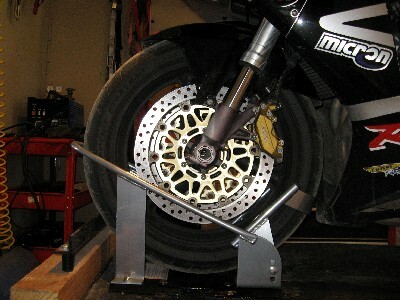 The wheel is secured not by clamping it from the side but by rolling it into a progressively narrower bracket in the front. One simply rolls the bike forward over the rear pivoting bracket and it secures itself. About the only criticism we have of the Haul-Master unit, and it's a very minor one, is that it requires a fairly hefty push to rock the bike over the rear pivoting bracket (and an equally sturdy pull to remove it) - a bit more than we are used to with other units. 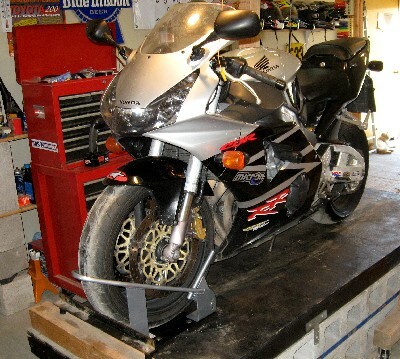 Once the wheel rolls over the rear bracket and rotates it into place the bike is locked securely though we'd absolutely recommend strapping the bike for long-term storage, transportation, or doing much work on it. Run, immediately, to Harbor Freight and grab one of these before they decide to start charging more.